Graphene Flagship scientists have managed to overcome the theoretical limiting performance of membranes in gas separation. This collaborative research from Graphene Flagship partners CNR, University of Bologna and Graphene-XT has possible applications in carbon capture and storage as well as hydrogen purification. Polymer-based membranes for gas separation have a trade-off between high gas selectivity and high gas permeability, the so-called Robeson upper bound. By uniting individual graphene oxide sheets with polymer spacers, in a sandwich style structure, the Graphene Flagship team has been able to overcome such restriction, separating gas efficiently and quickly. Focusing on creating a gas separation device beneficial for carbon capture and storage, the scientists came up with a protocol to separate CO2 from H2. Hydrogen production, both from natural gas or in gasification of solid or liquid fuels, is frequently accompanied by the creation of a substantial amount of CO2, which has to be eliminated before the gas is utilized. Efficient separation of the CO2 has more potential for trapping this greenhouse gas. Using a bottom-up method, the scientists placed alternated layers of graphene oxide and a polymer poly(ethyleneimine) - PEI, using a self-assembly technique, to form the gas separation membrane. By using graphene oxide, (a water-soluble graphene material because of its oxidized nature), the researchers were able to place separate graphene oxide layers divided by the PEI. 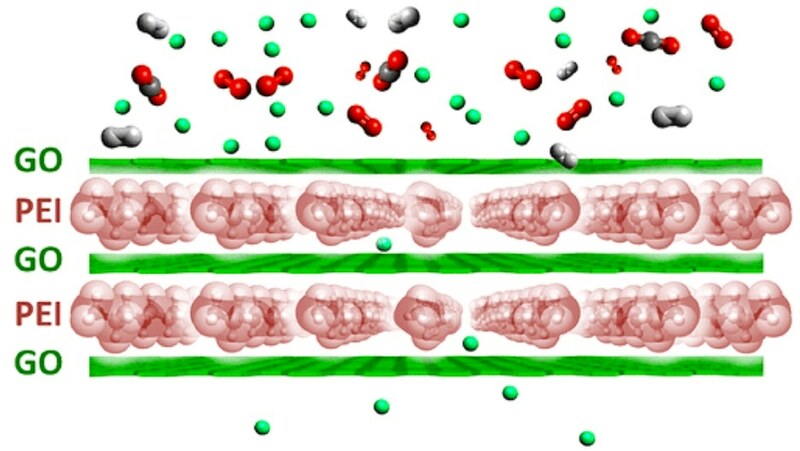 The depth of the PEI layer serving as a spacer between the graphene oxide layers was found to be extremely vital to ensure high gas flux through the membrane. This separation system thus comprises a layered material and an ultra-thin polymer layer with a thickness of approximately 2 nm. The graphene oxide sheets force the gaseous molecules to diffuse a torturous path inside the PEI chains. “By switching from the standard three-dimensional membrane to a layered polymer structure we achieved gas separation over the Robeson limit in a membrane only 100 nm thick,” said Professor Vincenzo Palermo, coordinator of the team performing this study and Vice-Director of the Graphene Flagship. Notably, it was also discovered that the permeability of these membranes to various gasses depends a lot on the diameter of the gas molecules. This gives to the membrane an exclusive selectivity that ultimately provides the gas separation method with tunable permeability and high selectivity as well as the potential to be used on the large scale. The increased functionality to the economical PEI films makes these gas separation membranes highly appealing for applications. “Through our collaboration with the University of Bologna and Graphene-XT within the Flagship, we have been able to assess the scalable nature of this research in industrial plants to separate gasses,” said Palermo. “The authors bring to a new level the concept of two-dimensional composites structures. They managed to produce periodic stacks of layered materials and one-dimensional polymers, on large areas, using weak electrostatic forces. In this way they observe a gas permeation process much different from what is observed in "classic" stacks of two-dimensional nanosheets,” said Xinliang Feng, the leader of the Graphene Flagship’s Functional Foam and Coatings Work-Package, “This work demonstrates the power and versatility of chemical approaches to build complex structures; noteworthy, it also comes from a collaboration of the Functional Foam and Coatings Work-Package partners with a partner SME supporting our spearhead projects”.